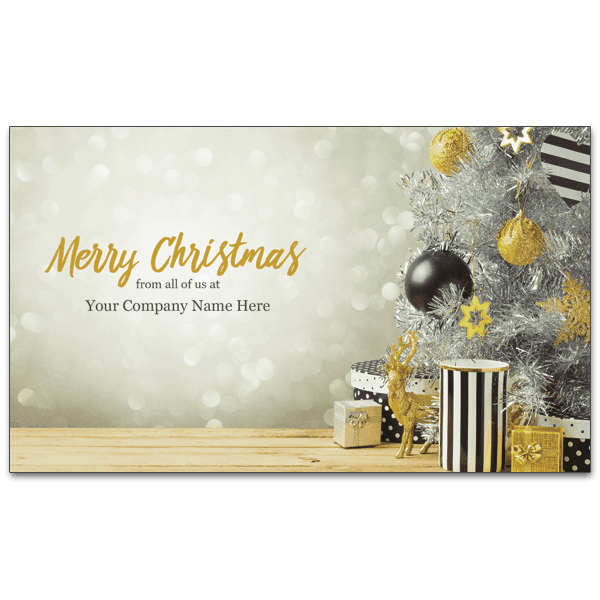 Personalised Christmas card with gold and black ornaments. Would you like us to print your inside message in colour? Please note, this does not affect the printing of the cover. We can handle mail out for you (fees apply). You can learn more here. If so, we’ll send a quote after you place your order. We can also send you complimentary envelope stickers. These either say “card only” or “happy birthday” depending on the type of card chosen. What Charity Would You Like To Support? All of our Christmas and birthday cards are 110mm x 185mm when folded and printed on 250-300 gsm cast-coated board with a gloss finish. Many cards are complemented with gold or silver foil - there is no extra charge for these foiled cards.